If you do need to run ctest in order to debug - if, for example, a test is failing when run in ctest, but not if run directly - then you can start the test off and then attach to the actual test executable from another terminal (or your IDE). You may need to pause or slow down the test using, e.g., the method described for Visual Studio debugging below. Create a new Debug Configuration. I called mine “DataHandling Test Debug”. Under “Common” you can put the debug config in your “favorites” menu. You can then run the debugger on this configuration from the Run menu or the toolbar. I’ve found that this method works with Visual Studio Express (which does not allow “attach to process”). Right-click the test project, e.g. DataObjectsTest. Under Debugging -> Command Arguments, type in the test suite and, optionally, single test name. e.g. “EventListTest test_MinusOperator_inPlace_3cases” in the screenshot below. Put a break point somewhere in the test code that will be run. Select the project and click Debug -> Start Debugging. The process here is not as straight forward as it is in eclipse. It involves a few steps, but it does work! 1. Edit the test to add a pause at the start of the test you are interested in. This will make the test wait for keyboard input, all you need to do is hit enter, but you can use this delay to attach to the debugger to running process. 2. Run ctest with the appropriate arguments to run the test you are investigating. 4. 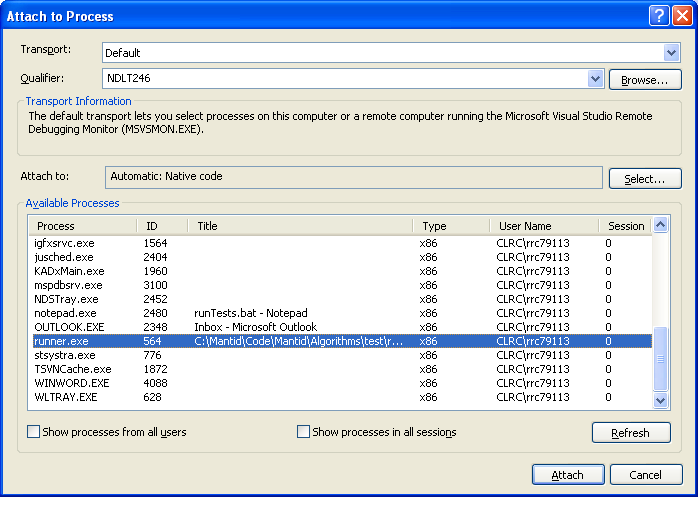 Select the test executable (e.g. DataHandlingTest.exe) from the list and click attach. Visual studio will change to debug mode. 5. Set any breakpoints you want, go back to the runner.exe window and hit enter to stop the pause. This should then ctach on any breakpoints you have set. 6. VERY IMPORTANT - Clean up when you have done, and do not check in with any paused tests!